Gift giving season is here! Choosing the perfect gift can sometimes be hard, but it doesn’t have to be. EVERYONE has to eat or cook a meal sometime, which is why cooking gifts are the best gifts! I have come up with a list filled with some of my favorite cooking items and some of the items that are on my wish list. 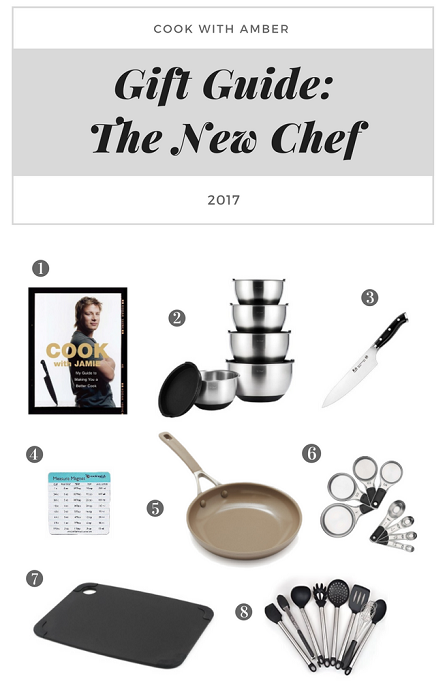 This guide is sorted by categories so that you can find just the right gift for the chef in your life. 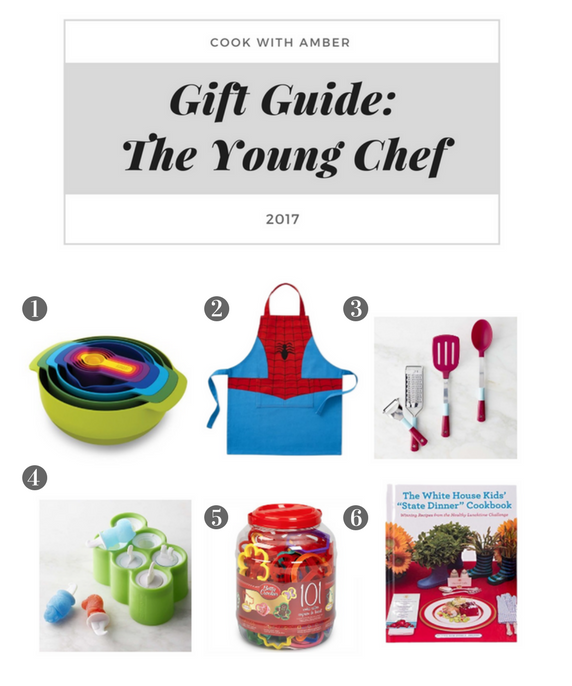 Scroll down or click here to shop for your young chef, baker, gadget-lover, or new chef. Happy shopping! Every young chef needs a great set of basic bowls to get them started. When I was younger, I started out cooking by just helping my mom dump things in a bowl. It may not seem like much now, but back then I felt like a total pro! This set has everything you need for mixing and baking. There is a tablespoon, measuring cups, mixing bowls with measurements, colander, and sieve strainer. Everything is stackable for easy storage and bright colors which kids will love. An adorable apron is a great gift for a new chef! There are so many cute and colorful options out there. I don’t wear them as much now, but when I was younger I had a ton of cute ones. I love this Spider Man apron from Williams Sonoma. What better way to get kids interested in cooking than by turning them into superheroes or other fun characters? A chef is nothing without her tools! Williams Sonoma has partnered with American Girl™ to create a line of cooking and baking gear to inspire young chefs to get excited about creating in the kitchen. This 4-piece utensil set includes a peeler, grater, spatula and spoon. Recipes and tips are included to get your young chef started. Popsicles are a fun twist to your favorite smoothie or yogurt recipe. Zoku is one of my favorite popsicle makers and now they come in fun shapes. This dinosaur set contains 6 pops including one prehistoric cavegirl and five dino-mite friends—a Stegosaurus, Pterodactyl, Tyrannosaurus, Triceratops, and Apatosaurus. The cuter the food, the more fun it is to eat!  Your young chef will have so much fun making adorable and wholesome snacks with these molds. When I was young, I loved making cute cookies in all shapes and sizes. Cookie cutters are a great way to get adorable crisp shapes every time. There are so many options out there, but I love this set with 101 cookie cutters! There is sure to be a shape to suit every occasion from Valentine’s Day to Christmas. We have so many cookie cutters at our house that we had to put them in TWO boxes! We can’t get enough of them. Plus, the great thing is you can use them for way more than just cookies, for example you can cut apples, watermelon or even pb&j sandwiches! I think this book is great for the young chef in your life because it’s filled with tons of amazing healthy recipes that are created by kids and their parents. Each one of these recipes won the healthy lunchtime challenge that was organized by the White House. So, they are all White House approved! These dishes are bound to get young aspiring cooks excited to get into the kitchen. If you guys don’t know, I won the healthy lunchtime challenge for Washington state in 2012 and my Nummy No-Noodle Lasagna makes an appearance in the book! The book is separated by state with over 100 recipes, you are bound to find one that you want to try. I really want to try the pizza with cauliflower crust because it looks fantastic! You can download a free .PDF of the book here. Cookbook holders are a common feature in most chef’s kitchens. These days, you need a tablet holder as well! Nobody wants to have to pick up their tablet in the middle of food preparation and get the screen all dirty. This tablet holder from Nordstrom is such a great gift because not only is it a super cool tool that will free up your hands and keep your cookbook or electronics clean, but you can even add a monogram to it. 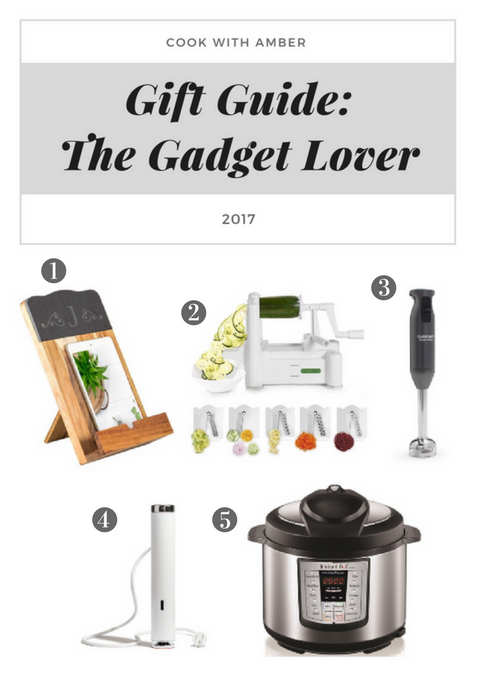 Your gadget loving chef is sure to love this gift! 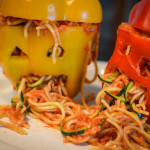 Zoodles are everywhere these days and this spiralizer gets a lot of use in our house. I use it for zucchini noodles, carrots, apples and my puking peppers. Every gadget-loving foodie needs one of these in their kitchen. Anything that makes vegetables or fruits easier to prepare and more fun to eat are a must have! An immersion blender is one gadget that saves me a lot of time in the kitchen. You can use this baby instead of pouring everything into a blender or food processor. All you do is hold it in your hand, turn it on and mix it around in the soup like you would a wooden spoon. Everything gets blended well and the cleanup is so easy! It’s a great time saver gadget! This Sous Vide tool from ChefSteps is on my wish list! The Joule is the smallest, most powerful sous vide tool available. The Sous Vide cooking method is said to cook meat to the perfect level of doneness. I am also excited to try some fun egg recipes. The Joule can be controlled by your Amazon Alexa device and it even has blue tooth and wi-fi integration! When I visited ChefSteps headquarters they gave me a demo of this Sous Vide tool and it was the coolest thing ever! This might just be the perfect gift for any gadget-lover this year. Instant Pot fans say that an Instant Pot will replace your Pressure Cooker, Slow Cooker, Rice Cooker, Yogurt Maker, Steamer, Sauté and Warmer. Wow! This model has Bluetooth integration so that you can monitor cooking progress from your smart phone. Even with all these cool tech features, the best part about the Instant Pot is the ability to cook meals FAST. After a busy day of school and volleyball practice, I need meals that are quick and simple. My family has an instant pot and we are in love with it! We are always trying out new recipes with it and it is a total time saver. Our favorite is making meatball in marinara sauce… and we are hoping to get a video out soon! This gorgeous pan is the perfect gift for a baker. This cast-aluminum pan will create stunning cakes that your baker will love to show off. If you are lucky, maybe they will bake you one. Silicone baking mats are such a timesaver in the kitchen! They keep your pans clean and save you from having to grease your baking sheets. These mats even help distribute heat evenly to promote browning and even cooking. They are super useful for any job that requires a no-stick surface. 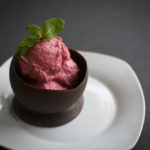 I like using them for when I make my chocolate bowls for my raspberry sorbet! This marble rolling pin is stunning! Not only is this rolling pin completely Instagram worthy, but marble is naturally cool and heavy which makes dough rolling a breeze. This one might just make it to my wish-list. Don’t be surprised if you see it in a future video! Every baker has measuring spoons, but they probably don’t have a set that is this pretty! This copper-plated set would make a great stocking stuffer or as part of a baking gift basket. Bakers put a lot of time and love into their baked goods, so they deserve a beautiful stand to display them! I love these pretty ruffled milk glass stands. They will make even the simplest cake look dessert-table ready. You can never have too many loaf pans, especially one that is this pretty! This pan is a beautiful dish to take along to parties and pot-lucks. 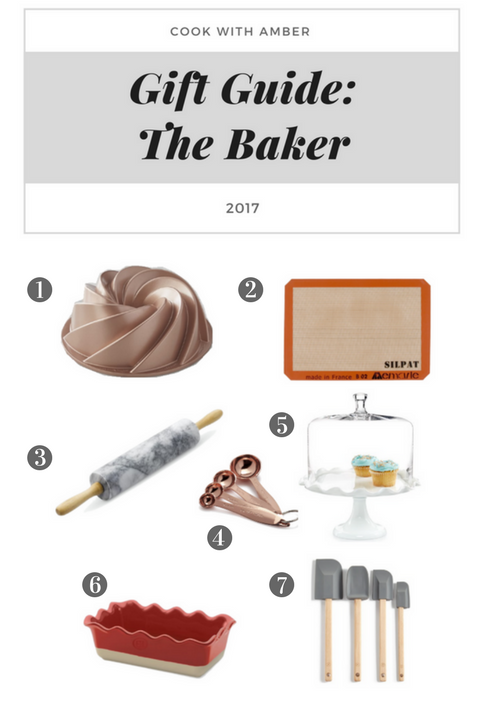 Your baker is going to love this! Tie these up with a pretty bow or wrap in a dishtowel, and they make the perfect hostess gift! Spatulas can be used in almost every baking task, and are something that you can never have too many of. There are so many great cookbooks out there! One of my favorites is Jamie Oliver’s, “Cook With Jamie: My Guide to Making You a Better Cook”. I think this cookbook is great for beginners because it explains the basics that you need to know to become a great chef. From listing out all the tools you are going to need, to breaking down all the different cuts of meat, you’re going to be all set. I really want to try his mushroom risotto or mussel spaghetti! Mixing, separating, whisking, prepping. A good set of bowls is important to help you keep all your ingredients close at hand. We love this set because they are stainless steel, have liquid measurement marks on the inside, and come with lids for storage. The great thing about these bowls is that they look great and can be used as serving bowls as well. Every chef needs at least one good knife. It is important for a chef to have a great knife not just to make food preparation easier, but it is also safer to work with a strong and sharp knife. This 8” knife from J-Henckels is a great place to start. Rather than buying an inexpensive set containing a lot of knives, purchase one great knife for your new chef. They will probably find themselves reaching for this one every time they cook! A magnet? Yes! This measurement magnet is a permanent fixture on my family’s magnetic knife strip. The magnet has a chart that converts cup measurements into Ounces, Tablespoons, Teaspoons and Milliliters. No need to look at your laptop or phone. Get this magnet as stocking stuffer and get one for yourself too! A great non-stick pan is an essential item for a new chef. I love non-stick pans because you can use less oil when cooking and they are so easy to clean. The Green Pan brand is my family’s favorite because it has a safe and non-toxic coating. You can use this pan with metal utensils and it cleans easily in the dishwasher. There are many beautiful and decorative cutting boards out there that make great gifts, however you also need a hard-working everyday cutting board in your kitchen. We love these composite cutting boards for daily slicing and dicing. These boards are super durable, and the best part is, you can toss them in the dishwasher when you are done. You can never have too many of these! When you first start cooking, it is hard to know which utensils you need to buy. Going to a cooking store can be so overwhelming. A set of cooking utensils like this 8-piece set from Amazon has everything a new chef needs to get started. All the basics are included: Serving Tongs, Turner Spatula, Flex Spatula, Pasta Server, Serving Spoon, Deep Ladle, 2 stage whisk and a Strainer. This set is also toxin free and dishwasher safe. This set is going to be a lifesaver!